I feel like I’ve been hibernating and now that the sun is out I’ve got many, many pages on my to-do list. This tic-tac-toe game is a project I’ve had in mind since late December. 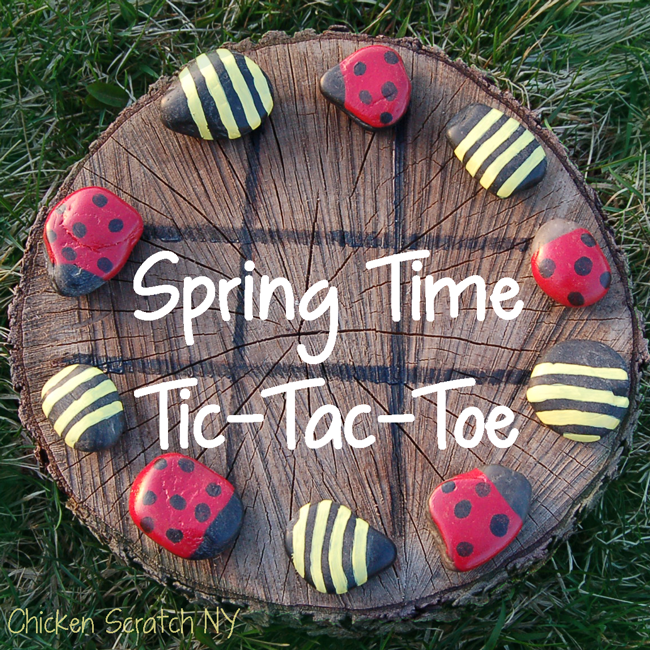 Forget the boring X’s and O’s, it’s time to add some life to the tic-tac-toe game with some insect-inspired stones. I went minimalist with simple stripes and spots to represent two of my favorite insects. Bumble bees and lady bugs just make me happy, like fields of dandelions and my dog. Luckily for all of us they’re easy to represent with a basic paint job! Painting the rocks is super simple but it may take a while if you need lots of coats. I needed about 5 coats for the yellow, 3-4 for the red and 2 for the black. The goal is to make happy little insect-like stones, no need to go crazy here! It’s simple enough that even my mom could do it (she banned Pictionary from our home, that’s how much she loves drawing) so I promise that you can! Decide which end will be the head and leave about 1/4 for the total length unpainted. For the bumble bees start painting yellow stripes across the top and down the sides. The number of striped you need will depend on the side of you rock and the width of your stripes. 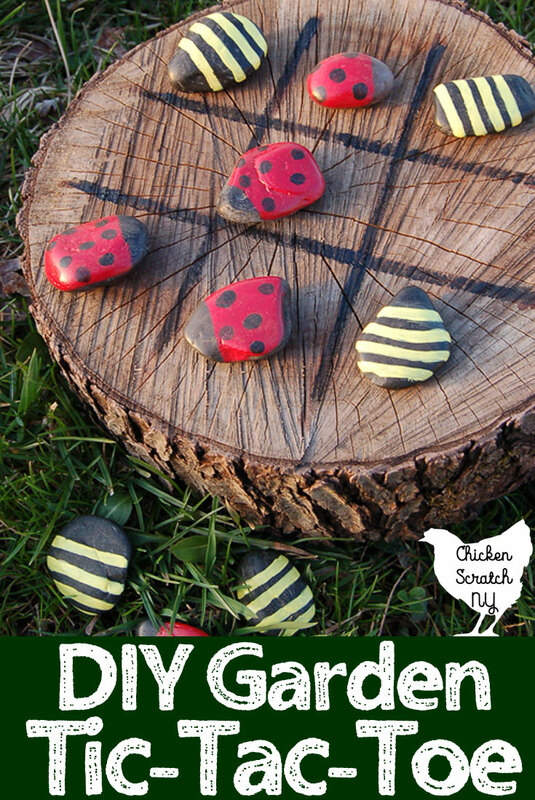 For the ladybugs paint about 3/4 of the stone red, after a few coats add the black dots on top. I like the look of an odd number of spots myself but it’s up to you! I free-handed the lines on the wooden disk in paint but if you were more motivated a wood burned game board would last much longer. I can’t wait to get to use the game this summer, I love how fast the games go. My kids are really into this game all of a sudden. Of course they aren’t playing the game but they are playing a game. These little painted stones have taken on a life of their own and have elaborate back stories according to my 2 & 4 year olds. Anything to keep them busy right? 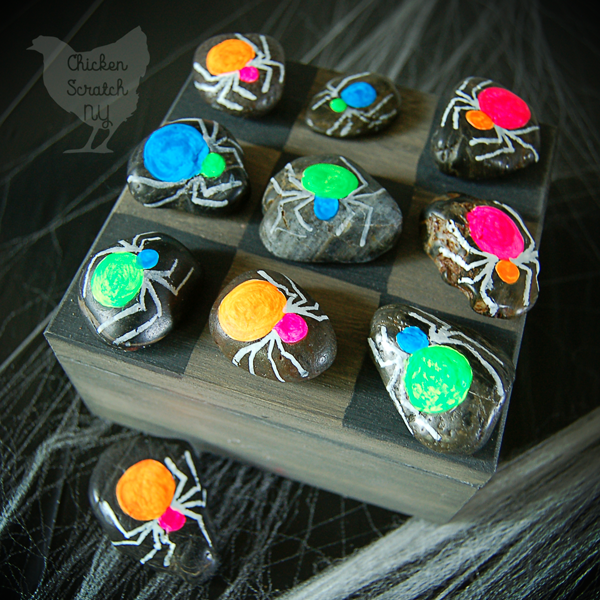 Keep the game going this fall with a Halloween Tic Tac Toe! A perfect find at a perfect time! I will be working w/ a group of youth in 3 wks and needed one more project for their group….this is definitely IT!!!!!!!!!!!!!!!!!!!!! This is really very cute! I’m going to start gathering rocks and do this for my granddaughter and I to play together! I made 5 of each, I’m not sure there is a set number but I’d guess 4 is the minimum. 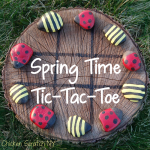 Just had to tell you that your adorable Spring Time Tic-Tac-Toe inspired my project and post today. A good friend shared with me a pin of your idea and I knew immediately I had to create my own version. I absolutely adore your fun and creative take on such a classic game. Hi! I loved the painted rocks ideas and I have featured you on my new blog post “Discovering nature: Painting & creating with rocks” . Love this, too stinkin cute! This looks so fun! I was trying to think of an End of the School Year/Summer Fun project for my 9- and 10-year-old students and if I can find someone to cut up a tree for me, I think this will be it. I like to encourage them to be creative, be outside, and limit their media time. Thank you! 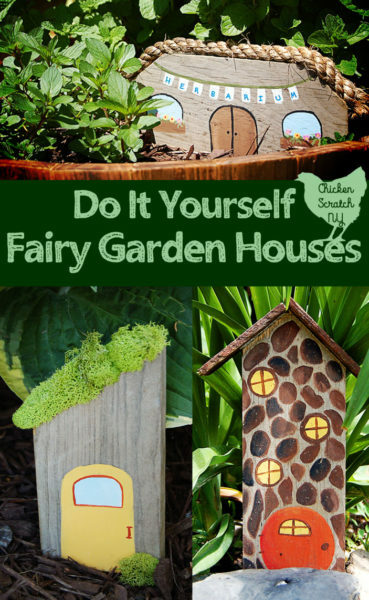 So cute – what a lovely idea! 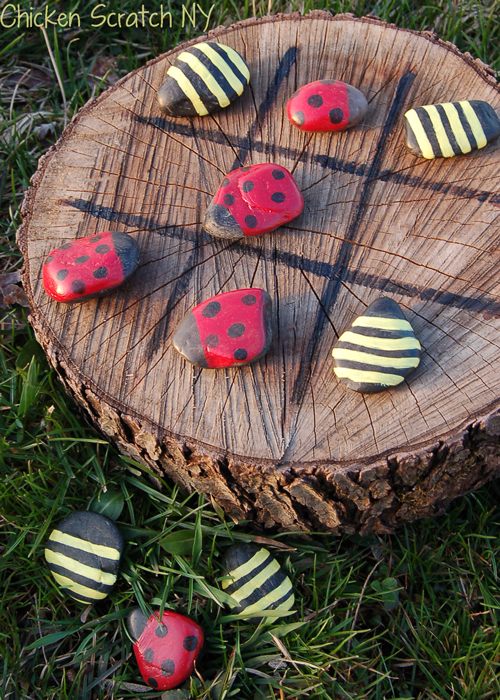 I’ve been painting loads of ladybirds and bumblebees the last few weeks – and love the idea of making a game board… now I got one to play on… all I need now is someone apart from the dogs to play with. Hahahah! Hi, These are gorgeous! Did you paint the underside too? Where did you get the wood round? Or was it cut from your yard? What is the diameter? Best idea ever. 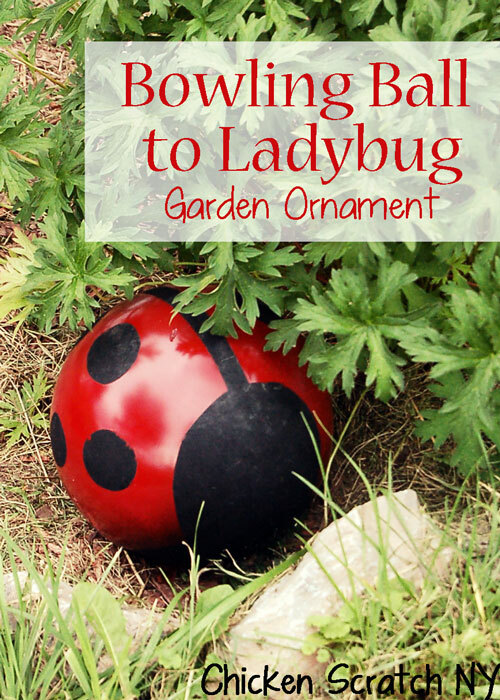 What a fun summertime project! how would you make them waterproof, i did this with my class using normal paint but we want them outside what would you suggest? 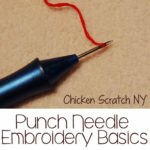 I shared this same idea on my site a few months ago. I got the idea from my sister-in-law, but I wonder if she got it from you. Sorry if you stumbled on it and thought I copied. If I did, I didn’t know it. My sister-in-law brought all the stuff to do at our family reunion last year. Anyway . . . if the idea did come from you . . . thank you! We had a blast with it at the reunion. Ooh! I’m going to try this with Mijnleiff. It’s played on a 4×4 grid, involves a little more strategy and still finishes up in 5 minutes. Hi! We used your cute idea in our camping activities roundup on our blog today. Just wanted you to know- Thanks so much for such a cute idea! I can’t wait to make it with my own little ones! I’m not very good with paints ( worse than your mom) so I painted half red and half yellow and then made stripes and dots with a black sharpie. Came out great! Featuring your project in our studio this month. Will credit you as source in our project tutorial, with your permission! absolutely 🙂 send me a link when it goes up! Awesome project! And it looks great! I want to make one for a friend. Did you use a preservative on the wood to prevent it from cracking over time? What did you use? I have been researching this and I haven’t found a practical way to stop it. I was wondering the same thing. I just made one, but with daughter and boyfriends favorite NFL team vs other team. I was going to modge podge it, but wasn’t sure how it would look. So cute! What size wood round is that? Thanks so much!